This article is about California Gold Mining Inc.’s latest news regarding its industrial hemp segment. I will stick to the hemp segment and not discuss the gold exploration side of the business, as there’s no new news on that front. GH#1 is expected to be completed in the third quarter, and the first harvest of seeds and first revenue is anticipated in the fourth quarter. As far as I know, there are no plans for a second greenhouse. However, in my opinion only, if GH#1 is a success, and if seed demand warrants, then a GH#2 could be built next year. GH#2 (if built) would presumably be self-funded from the profits of GH#1. The LOI received by CGM expresses DVL’s intention to purchase up to a combined total of 5,000 pounds of high CBD-content hemp seeds from CGM this year and next. The pricing of the seeds will be determined at each harvest time, derived from prevailing wholesale market prices, minus 5%. 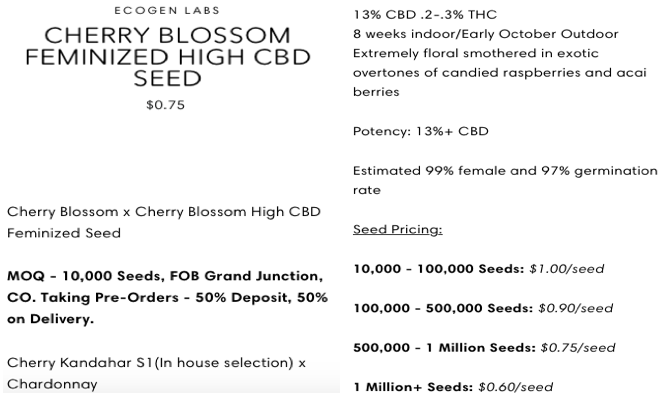 Note, most online offers of premium quality, high-CBD content hemp seeds like the ones that CGM proposes to propagate are only available by calling or emailing the sellers. 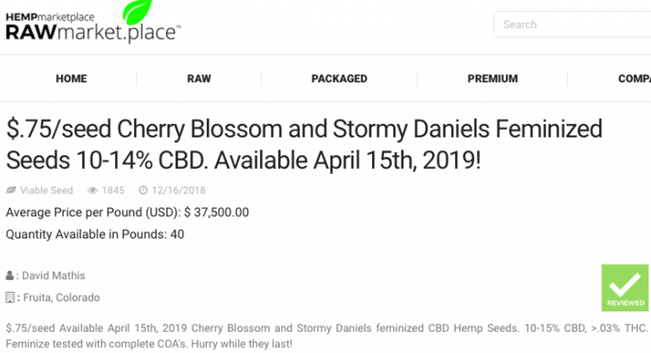 The press release refers to Oregon CBD Co., Blue Forest Farms and Cheyenne Mountain Seed Co, but for competitive reasons, these companies do not reveal pricing online for their premium quality seeds. According to the press release, current wholesale prices range from US$15,000 to US$30,000 per pound (based on quotes from the above mentioned companies). I have found three examples of what could be comparable high CBD-content hemp seeds. (See images above and below). NOTE: These are just the items I could find online, they may or may not be representative of the overall wholesale market for premium quality hemp seeds. How Big an Opportunity Is This? Pretty Big. . .
As a frame of reference, let’s play with the math, remembering though that construction of GH#1 has not yet begun! Five thousand pounds x US$15,000 = US$75,000,000 in gross revenue, minus a 5% discount to DVL = net revenue of US$71,250,000. But, that’s over only about a 1.5 yr. time framethrough 2020; GH#1 might not be capable of that much production so quickly. I’m assuming a total of 3,000 pounds of seed can be sold to DVL by the end of next year. That would generate net revenue of C$56,857,500. To be clear, DVL would get a well-deserved portion of that amount in fees, call it 10%, leaving ~C$51.2 million in adjusted net revenue to CGM. Compare that figure to the company’s market cap of ~C$33 million. Management also announced that it has signed a comprehensive consulting agreement with DVL. CGM is very wisely outsourcing all operations related to the its industrial hemp seed cultivation project at Fremont. As part of the agreement, DVL and CGM agreed to work exclusively together for the cultivation of industrial hemp seed, oil and fiber within the states of California, Oregon, Washington, Nevada and Arizona. DVL’s compensation is described as including “a greenhouse construction oversight fee, a greenhouse management fee and a modest bottom-line profit-share based on numerous production thresholds.” So, not much insight there, but I think that CGM is getting a great deal with DVL, assuming that it delivers on its end. Even if DVL were to end up with 20% of GH#1’s economics, but it sounds like it’s closer to 10%15%, that would still be very attractive for CGM. Importantly, CGM maintains 100% ownership of GH#1 and everything relating to its industrial hemp seed propagation business segment. This is also a good deal for DVL, a true win-win relationship, because it will have the fully permitted, funded and built GH#1 at its disposal (it will be operating it), to test new hemp seed and plants. Recall that the partners intend to develop and patent high-end strains of hemp. Patented strains are expected by DVL to be more valuable and to remain higher priced for a longer period of time. DVL will also have a guaranteed supply of seeds, which it can presumably sell at higher prices (in smaller quantities). Importantly, it has to execute at GH#1 in order to get its supply of seeds, so both parties’ interests are aligned. What to make of the mention of the four states: Oregon, Washington, Nevada and Arizona. It would have to mean acquisitions or joint ventures with other companies because CGM has no business interests outside of the state of California. While it’s exciting to speculate about what CGM might do with excess profits from GH#1 or perhaps even a GH#2 (if built), I have no idea if the company is pursuing opportunities outside of California at this time. My guess is that all eyes are on GH#1 for the remainder of the year! Disclosures: The content of this article is for information only. Readers fully understand and agree that nothing contained herein, written by Peter Epstein of Epstein Research [ER], (together, [ER]) about California Gold Mining, including but not limited to, commentary, opinions, views, assumptions, reported facts, calculations, etc. is not to be considered implicit or explicit investment advice. Nothing contained herein is a recommendation or solicitation to buy or sell any security. [ER] is not responsible under any circumstances for investment actions taken by the reader. [ER] has never been, and is not currently, a registered or licensed financial advisor or broker/dealer, investment advisor, stockbroker, trader, money manager, compliance or legal officer, and does not perform market making activities. [ER] is not directly employed by any company, group, organization, party or person. The shares of California Gold Mining are highly speculative, not suitable for all investors. Readers understand and agree that investments in small cap stocks can result in a 100% loss of invested funds. It is assumed and agreed upon by readers that they will consult with their own licensed or registered financial advisors before making any investment decisions. At the time this article was posted, Peter Epstein owned shares of California Gold Mining and the Company was an advertiser on [ER]. Readers understand and agree that they must conduct their own due diligence above and beyond reading this article. While the author believes he’s diligent in screening out companies that, for any reasons whatsoever, are unattractive investment opportunities, he cannot guarantee that his efforts will (or have been) successful. [ER] is not responsible for any perceived, or actual, errors including, but not limited to, commentary, opinions, views, assumptions, reported facts & financial calculations, or for the completeness of this article or future content. [ER] is not expected or required to subsequently follow or cover events & news, or write about any particular company or topic. [ER] is not an expert in any company, industry sector or investment topic. Calling this latest development “excellent news,” Paradigm Capital has raised its target price on the company’s stock. In an April 9 research note, analyst Rahul Sarugaser reported that Paradigm Capital raised its target price on Tetra Bio-Pharma Inc. (TBP:TSX.V; TBPMF:OTCQB) to CA$1.75 per share from CA$1.50 after “the excellent news” it was restarting its Phase 3 clinical trial of PPP-001. The company’s current share price is around CA$0.66 per share. “The resumption of this Phase 3 trial, particularly now that it is registered with the U.S. Food and Drug Administration as well as Health Canadaincreasing its market by 10 timeswhen it begins would likely be significantly accretive to our valuation,” Sarugaser commented. He explained that Tetra’s study was put on hold in January because two microbial contaminants were discovered in batches of its PPP-001 cannabis pellet drug, which the company had sourced from Aphria. At the time, it was estimated the issue would delay the trial by six months, until July. However, Tetra is back on track, three months earlier than expected, and is ready to relaunch the study. Now called SERENITY, the clinical trial will test PPP-001, now called CAUMZ, in 300 patients with advanced cancer pain, enrolled at 20 sites across the U.S. and Canada, Sarugaser explained. CAUMZ will be administered via a Health Canada-approved vaporizer. If patient registration starts in June, the trial could be completed by year-end 2019. Accordingly, Tetra could then apply to both regulatory agencies for approval of CAUMZ by early 2020. Paradigm has a Buy rating on Tetra. The analyst (and associate) certify that the views expressed in this report accurately reflect their personal views about the subject securities or issuers. No part of their compensation was, is, or will be, directly or indirectly, related to the specific recommendations expressed in this research report. Analysts are compensated through a combined base salary and bonus payout system. The bonus payout is determined by revenues generated directly or indirectly from various departments including Investment Banking, based on a system that includes the following criteria: reports generated, timeliness, performance of recommendations, knowledge of industry, quality of research and investment guidance and client feedback. Analysts are not directly compensated for specific Investment Banking transactions. There isn’t much time left for big pharma to make a move, Rahimi indicated. Last week, at Galmed’s post Phase 2 meeting with the FDA, the agency gave the company the greenlight to proceed with its Phase 3 ARMOR trial of Aramchol in nonalcoholic steatohepatitis (NASH) patients with fibrosis. During the meeting, the two parties agreed on key trial design components, including patient population, endpoints, treatment duration and dose. Second, Rahimi pointed out, Galmed is trading eight to 16 times lower than other biopharma companies on the brink of a Phase 3 trial, the valuation making the company attractive from a suitor’s standpoint. Third, Galmed’s drug candidate is “highly safe and globally tested,” as about 200 centers, in the U.S. and around the world, were involved in the previous ARMOR study. Last, because the company’s Phase 3 Aramchol study in NASH would be global, the cost to conduct it would be about five times less than what it would be in the U.S. alone. In other news, Rahimi reported, Galmed had a poster presentation at the recent annual meeting of the European Association for the Study of the Liver. It contained preclinical data that show Aramchol improved liver glucose homeostasis in a NASH mice model. Specifically, mice fed the MCD diet, containing 0.1% methionine, and administered Aramchol demonstrated statistically significant reductions, or about 1.5 to four times the control, in key markers. They also showed dose-dependent improvements in glycolysis and gluconeogenesis. “The poster noted that the reduction in FBP (first irreversible step in glycolysis) could be responsible for the regulation of the adenosine monophosphate-activated protein kinase activity, signifying altered control of energy homeostasis,” Rahimi noted. ROTH has a Buy rating and a $32 per share price target on Galmed, whose stock is trading today at around $8.02 per share. Within the last twelve months, ROTH has received compensation for investment banking services from Galmed Pharmaceuticals Ltd.
ROTH makes a market in shares of Galmed Pharmaceuticals Ltd. and as such, buys and sells from customers on a principal basis. Within the last twelve months, ROTH has managed or co-managed a public offering for Galmed Pharmaceuticals Ltd.
2. COMMERZBANK AG – stocks of the German bank. 1. 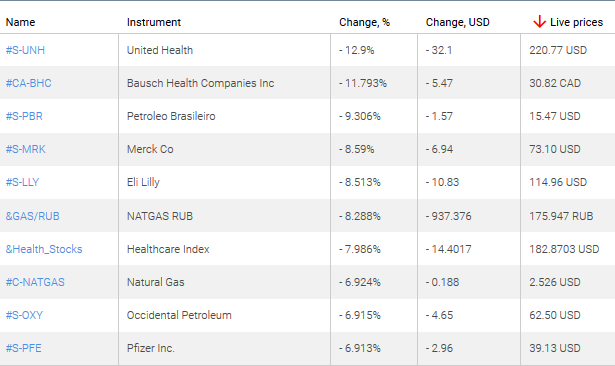 United Health Group – stocks of the American medical and pharmaceutical company. 2. Bausch Health Companies Inc – a Canadian pharmaceutical company and a medical equipment manufacturer. 1. AUDCHF, AUDNZD – the growth of this chart means the strengthening of the Australian dollar against the Swiss franc and the New Zealand dollar. 2. EURTRY, EURJPY – the growth of this chart means the strengthening of the euro against the Turkish lira and the Japanese yen. 1. 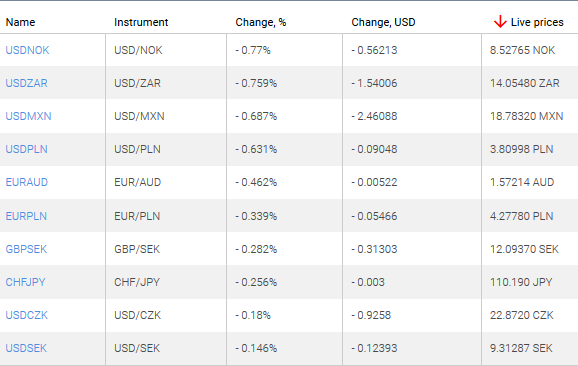 USDNOK, USDZAR – the decrease in these charts indicates the strengthening of the Norwegian krone and the South African rand against the US dollar. 2. USDNOK, USDCZK – the decrease in this chart indicates the strengthening of the Norwegian krone and the Czech koruna against the US dollar. Premier Health Group Inc. (PHGI:CSE; PHGRF:OTCQB; 6PH:FSE) announced in a news release it launched a strategy to expand its footprint in the medical cannabis industry internationally. Its approach is to educate physicians about medical marijuana through the adjunct software embedded in its electronic medical records (EMR) platform. It is working to sell its EMR product in the quickly growing medical cannabis markets around the world, including the United States, the United Kingdom and Australia. Today, according to the company release, medical cannabis is legal in about 30 countries in some capacity. A handful of others also allow its use on a strictly limited basis, as in cannabis-derived pharmaceuticals only. The announcement notes the global medical cannabis industry is expected to generate about $40.9 billion by the end of 2024, according to Zion Market Research. The EMR market is expected to grow to $30.4 billion by 2023, P&S Market Research showed. Premier stated a gap exists, particularly in countries lagging behind Canada in their adoption of medical cannabis, between patients’ needs and/or desires and primary care physicians’ comfort level with medical cannabis, as well as their being knowledgeable enough to prescribe it. Premier Health aims to bridge that divide by educating physicians with the data and tools available through its EMR software, which will help them prescribe the most appropriate cannabis product at the ideal dosage. “By innovating and integrating these increasingly in demand capabilities, Premier Health will be equipped to significantly increase its market share of the $30 billion EMR market,” CEO Dr. Essam Hamza said in the release. 2) The following companies mentioned in this article are billboard sponsors of Streetwise Reports: None. Click here for important disclosures about sponsor fees. As of the date of this article, an affiliate of Streetwise Reports has a consulting relationship with Premier Health Group Inc. Please click here for more information. Within the last six months, an affiliate of Streetwise Reports has disseminated information about the private placement of the following companies mentioned in this article: Premium Health Group Inc.
European stocks added to previous session buoyed by strong corporate reports. The EUR/USD joined GBP/USD’s slide but both are currently higher. The Stoxx Europe 600 index added 0.2%. Germany’s DAX 30 rose 0.6% to 12222.39 despite weak manufacturing PMI report. France’s CAC 40 added 0.2% and UK’s FTSE 100 slipped 0.2% to 7459.88. Markets will be closed today for Good Friday. Asian stock indices are mixed today in a thin trading on Good Friday as most markets in Europe and US will remain closed today. Nikkei ended 0.5% higher at 22200.56 despite yen continuing its climb against the dollar. Chinese market is higher: the Shanghai Composite Index is up 0.6%. Markets in Hong Kong and Australia are closed for a holiday. Brent futures prices rose yesterday on a drop in crude exports from Saudi Arabia, and a drop in active US drilling rigs as well as oil inventories last week: Brent for June settlement closed 0.5% higher at $71.97 a barrel on Thursday. Oil trading in the US and Europe will be closed for Good Friday. The US stock markets took a nosedive early in the regular trading session after the QQQ briefly advanced to new All-Time Highs this morning. With the QQQ and other symbols nearing fresh new highs, traders should expect volatility to increase as trading systems and traders to look for any signs of a top to set up. As we start to cross into “new high territory”, some fear starts to come back into the markets and volatility is sure to increase. The Russell 2000 took a pretty big hit today as you can see from the chart below. This move lower is still well within our proprietary Fibonacci modeling system’s bullish parameters and we’ve highlighted a “Support Zone” for our followers to understand where real price support is located. Any downside move below $152 would cause us to reconsider our bullish trend position, but right now this is nothing more than price rotation. Wait it out and look for opportunities when it bottoms. 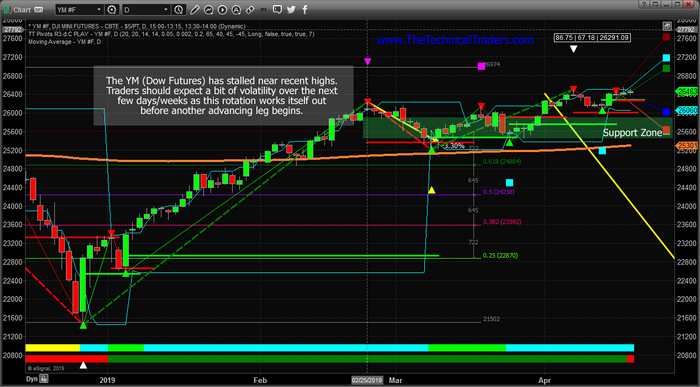 The YM (Dow Futures) Daily chart, below, highlights just how fractured the US stock market really is today. While the Russell 2000 is rotating lower quite hard, the DOW futures are relatively FLAT and still trading near the recent highs. This fracturing of the major indexes suggests money may be moving away from sectors/symbols that traders may interpret as risky at the moment – and into symbols that are more stable. For example, we might find that Financials and the Russell 2000 symbols may present a relatively high level of fear that a downside rotation in these sectors may be bigger and more dramatic than in the NQ, ES or YM. Still, our advice is to watch this move and wait it out a bit. 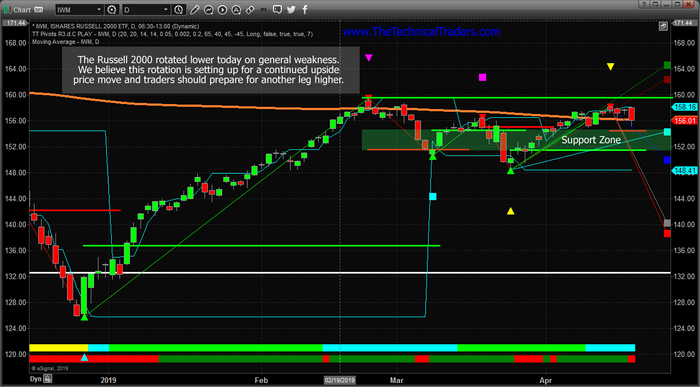 Our “Support Zone” for the YM is clearly highlighted with the Green Box on the chart. Lastly, we want to highlight the Transportation Index for all of our followers to understand what is going on behind the scenes today. 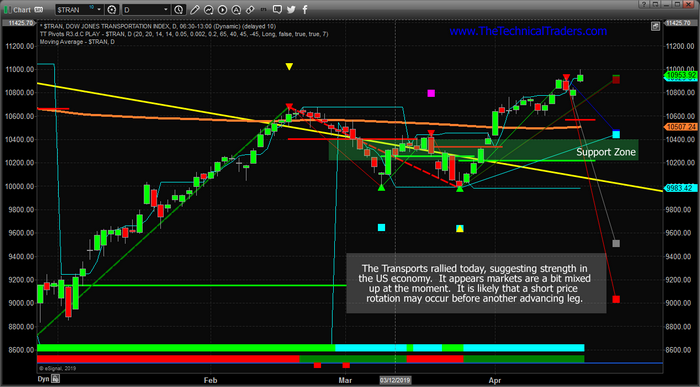 The Transportation Index is a fairly strong measure of future economic activity and output. It typically leads the US stock market by at least 20~30 days. The price advance, today, in the Transports would indicate that many traders believe the US economy is still improving and will still continue to perform well. If the Transports break to new highs, then we should see more continued upside price levels in many of the US stock market sectors. Again, the markets are a bit fractured today with price action. And that leads us to believe we could see a spike in the VIX and volatility over the next few days/weeks while this rotation plays out. Eventually, we believe a continued upside price leg will resume and we want to urge traders to play it safe for right now. Follow our “Support Zones” as a key indicator for when the price has fallen into a potentially risky level – below support. If this happens, then we would begin to become concerned that price may be initiating a bigger move to the downside. Get my daily analysis and swing trade alerts at my Wealth Trading Newsletter and become a technical trader today! European stocks extended gains on Wednesday buoyed by better than expected Chinese data. 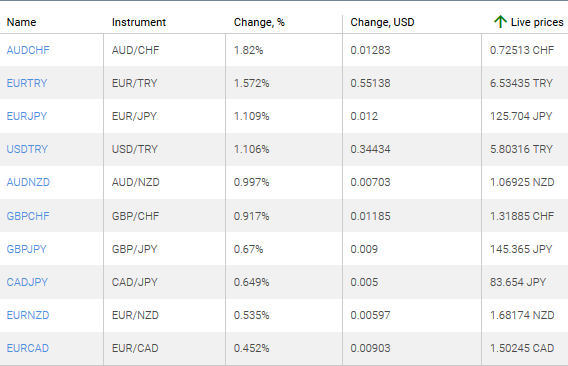 The EUR/USD turned higher while GBP/USD continued its slide with euro lower currently and Pound little changed. The Stoxx Europe 600 gained 0.1% led by auto shares. 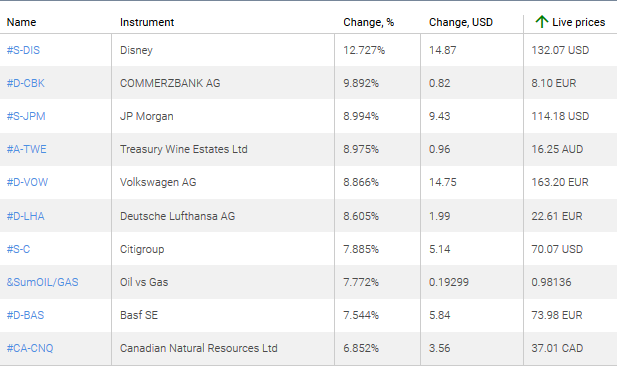 Germany’s DAX 30 rose 0.4% to 12153.07 despite country’s economic growth downgrade for 2019, France’s CAC 40 advanced 0.6% while UK’s FTSE 100 added 0.02% to 7471.32. Asian stock indices are mostly down today as North Korea test-fired a new tactical guided weapon. Nikkei lost 0.8% to 22090.12 as yen resumed climb against the dollar. China’s stocks are lower despite a report US and China may sign the trade deal in late May: the Shanghai Composite Index is down 0.4% and Hong Kong’s Hang Seng Index is 0.6% lower. Australia’s All Ordinaries Index turned 0.05% higher with Australian dollar little changed against the greenback. Brent futures prices are retreating today. Prices fell yesterday despite report US gasoline stocks fell by 1.4 million barrels while crude stockpiles declined by 1.2 million last week. June Brent crude lost 0.1% to $71.62 a barrel on Wednesday.